Ruth Moffatt, a Bruce Trail member, was looking for a hiking experience to enjoy over the March school break. She first reached out to Avon Trail through our Facebook page to confirm the viability of hiking the length of Avon Trail in March conditions. Then Ruth planned through Bernard and Carolyn Goward to confirm end to end badges could be purchased to mark completion. The next step was to advertise the hike with hiking clubs from Toronto to London, terming it “March Break Hiking Madness”. Hikers registered to join the hike. Ruth, using the Avon Trail Hiking Guide and the Ondago Avon Trail app, planned out the start and ending points for each day. 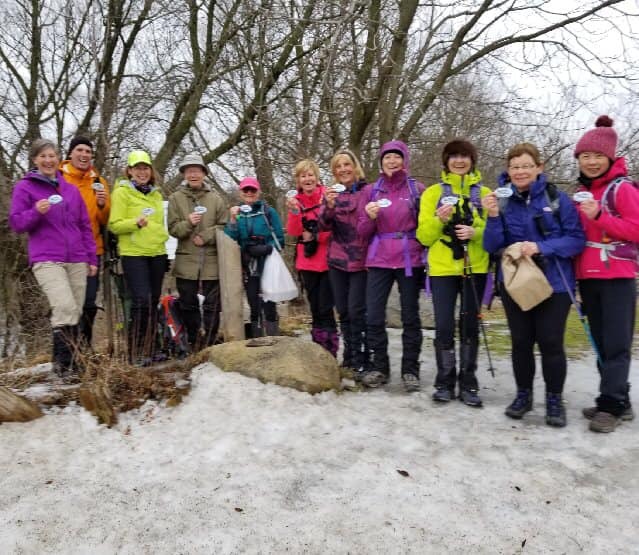 “Once I had a roster of participants, I asked everyone to consider taking out Avon Trail memberships, to purchase the paper hiking guide and to download the Ondago Avon Trail app to their smart phones” said Ruth when interviewed about the hike. Fifteen hikers started out on day 1 but not all intended to hike on all five days. “I asked everyone to volunteer at least twice for the car pool shuttles”, she said. “We had 15 people the first day, so I knew that we would need at least 4 to 5 vehicles to manage the shuttle”, Ruth explained. “It is typically up to the passengers in the car to navigate the driver to the starting location”. Each hiker was to bring a plastic bag with them for their dirty, muddy boots for the shuttle back at the end of the day. They came prepared for rain each day but were spared with some warm spring like conditions. As Ruth explained, group hiking etiquette was followed. A sweep appointed for each day, the pace agreed, breaks and lunch period arranged. All hikers carried out with them paper and food waste like peels and cores. “If you didn’t pick it there, don’t throw it there”. All hikers prepare their own lunches and snacks, carrying their supplies in a back pack. Needed supplies would be purchased at the end of each day. Accommodations planning? Three of the hikers stayed at motels in Stratford, two for three nights and one for 5 nights. The motels chosen were the Traveller’s Motel and the Festival Motel. “Some of our group stayed with friends in St. Marys and others traveled back to Burlington at night”, said Ruth. Food purchases were made at Zehrs with breakfasts and dinners for some at fast food restaurants in Stratford. Here are the start and end points for each hike day, from St.Marys to Conestoga.